The Stay-Puft Marshmallow Man wreaked some havoc in his time, but who would have thought that his inspiration — the Pillsbury Doughboy — would act the part of a veritable Gozer the Destroyer himself, at the expense of a funky new-age bakery? A few weeks ago, the founder of a Salt Lake City-based bakery, My Dough Girl, got a letter from General Mills, the conglomerate that owns Pillsbury. To the 45-year-old entrepreneur’s surprise, the food giant had written to inform her she needed to change the name of her business — claiming it was too similar to Pillsbury’s famous doughboy mascot — or she risked facing legal action. Cromar decided, essentially, that was just the way the cookie crumbles. “I started baking cookies as a way to bring happiness to myself and others, so I really didn’t need this to become some canker on my existence,” Cromar said. “Plus, I just don’t have the resources to fight them.” The case marks the second time in recent weeks that a major corporation has taken issue with a small business over possible trademark infringement. “The second time in recent weeks,” eh? That must be awful. Sit down, have a croissant. Let’s talk about this. Dough boy, dough boy, dough boy… where have I heard that? Right — over here (right) — those guys. But while there are batches and batches of DOUGHBOY trademark registrations — some dead, but plenty alive — it does seem that Pilsbury is understandably sensitive about the use of the term in association with baked goods, made famous by its lovable mascot, POPPIN’ FRESH® ! Well actually, a bunch of POPPIN’ FRESH registrations seem to have gone stale, but evidently he’s still a doll (Reg. No. 72307131), and ain’t he? Anyway, back to his, uh, generic name — the DOUGHBOY thing. Well before we even talk about whether a bakery called DOUGH GIRL is likely to be confused with a commercial baked goods company’s DOUGHBOY , did you notice the graphic on top up there? How Pillsbury uses a “TM” instead of a ® symbol all over its site? Reg. No. 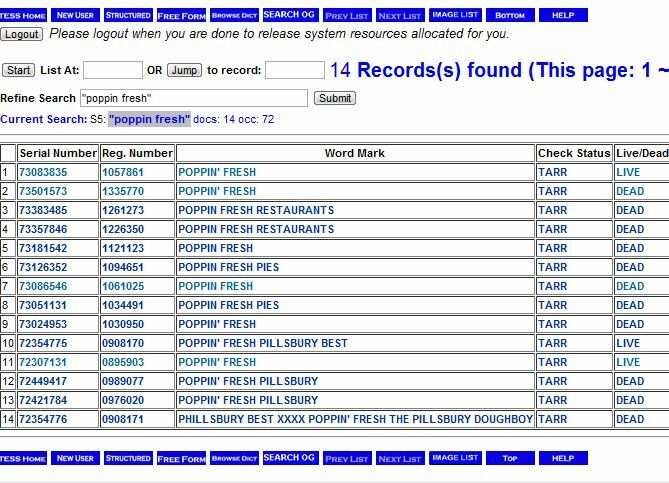 2764538 is for “Refrigerated dough.” Same deal. Reg. No. 2091501 is for “Clothing, namely, T-shirts [and boxer shorts].” Class 25. Well, sure. Ok, still, that seems close enough, doesn’t it? If I were Pillsbury I wouldn’t want anyone selling baked good using DOUGHBOY either, and I’ve got some good and famous registrations to help me stop them. So why does the Pillsbury site utilize the TM — a common-law assertion of trademark rights, rather than an indication of federal trademark registration — instead of the “circle R”? The reason seems to be that Pillsbury is being careful, and is well advised by its counsel. 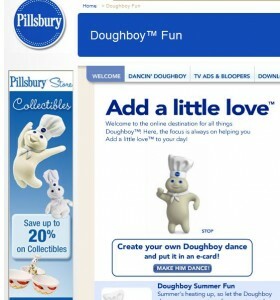 See, as the excerpt above readily demonstrates, they’re using the DOUGHBOY™ trademark (which, contrary to what some people think — and don’t bother to confirm — is not used in a way that “always seems to include the Pillsbury name”) far more broadly on the site, and everywhere else in creation, it seems, than the uses described in these registrations. The Circle-R symbol indicates that a mark is federally registered. It’s irksome when parties use it without having met the rigors needed for its lawful use. It’s even more irksome that the Lanham Act doesn’t penalize owners for displaying the symbol when they haven’t earned it. Imagine the PTO’s reaction when it got the drawing of this applied-for trademark design— sporting the Circle-R — falsely signaling it already has a federal registration. The PTO’s response? A mild office action directing that “Applicant must submit a new drawing with the ‘®’ deleted because it is not part of the mark.” What else could the PTO do? Ignorance is probably responsible for most misuse, but fraud is at the heart of some of it. I only wish the Lanham Act punished knowing misuse. Well, they do some things right at Pillsbury. You have to respect that. 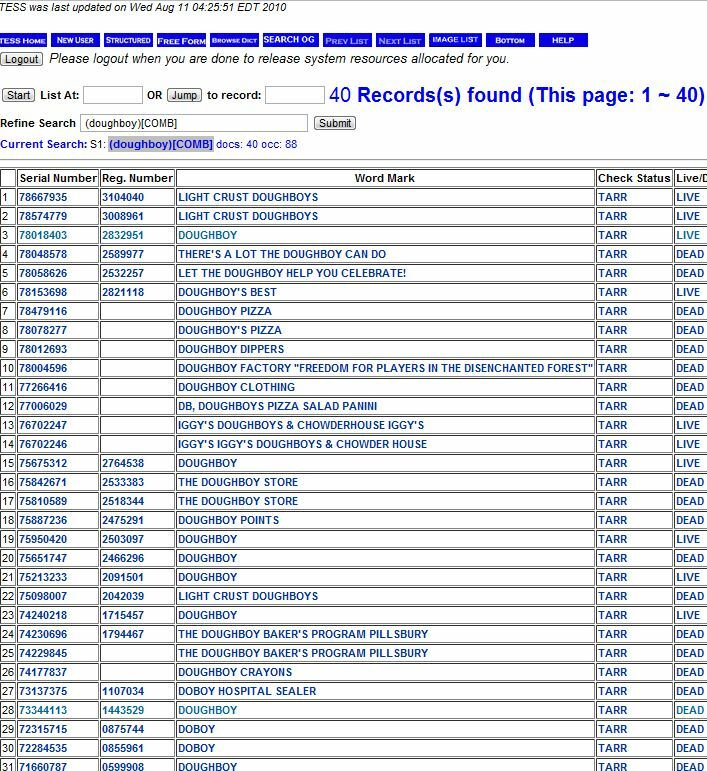 And I don’t really, really, know why they don’t have a registration for the whole bowl of dough, except I can say that, looking at the fairly complicated field and history of DOUGHBOY and DOUGH BOY marks out there, it could be more trouble than it’s worth for them to do so. On the other hand, as common law marks for a whole line of business go, this is a good one. Which brings us back to dough — specifically, the trademark MY DOUGH GIRL. DOUGH BOY —> MY DOUGH GIRL? Is there LIKELIHOOD OF CONFUSION? (6) the strength or weakness of the marks. Sally Beauty Co., Inc. v. Beautyco, Inc., 304 F.3d 964 (10th Cir.2002). No one factor is dispositive. Similarity? Not much, really. This is a pretty subjective undertaking, of course, but as we say here in New York, likelihood of confusion comes down to “The ultimate question of whether, looking at the products in their totality, consumers are likely to be confused,” right? 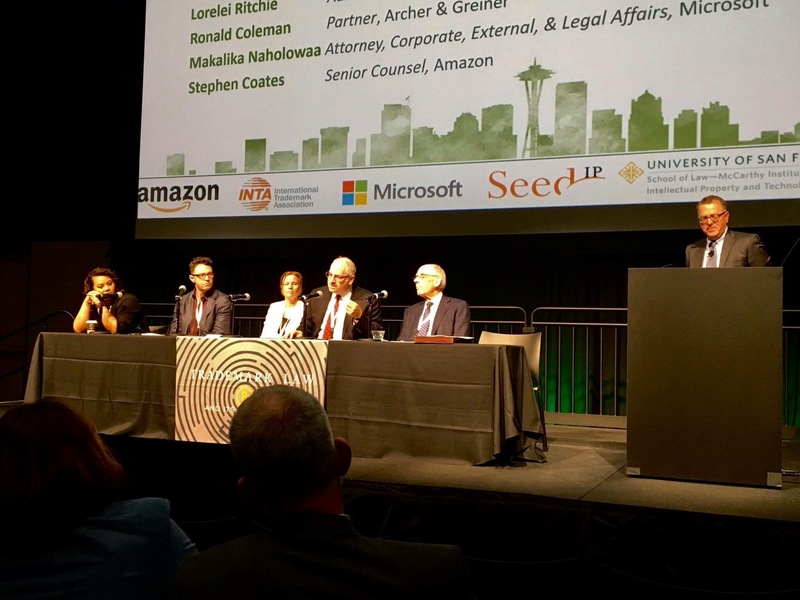 Well, gut-level-wise — which, after three years and half a million to a zillion dollars of litigation down the road, is what this factor seems to always come down to, survey or not — this trademark lawyer doesn’t think that, looking at the products in their totality, consumers are likely to be confused. Intent? A toss-up, absent some smoking gun (e.g., email that says, “Hey, let’s name the bakery after the Pillsbury Dough Boy!”). Actual confusion? Call me crazy but I’m willing to bet it’s non-existent. Similarity of products and marketing channels? This one goes to Pillsbury on points. Yeah, they don’t have retail stores; yeah, My Dough Girl doesn’t sell home-ready-baking products as Pillsbury does; but those distinctions are probably too fine. Baked goods sold at retail are baked goods, pretty much. Degree of care by purchasers? Enough here that I’d give this one to My Dough Girl. Let’s face it, going back to factor # 1, of which this is really just a corollary — come on. No one is walking into this bakery and thinking they’re buying stuff from Pillsbury. Strength of the mark? That’s what the whole first part of this post is about. Verdict on this factor: It’s strong, man, it’s strong. So: Who wins? Well, this is, of course, the worst sort of armchair litigating here. On the other hand, this is a blog, so there you go. The other caveat: There’s probably a colorable trademark dilution claim here that is stronger than the infringement claim. But in terms of infringement? Well, that’s a very abstract question, isn’t it? Let’s just say this: If I were Pillsbury’s lawyer, I would have written that letter, too. There’s something you don’t see every day. But given that low baseline standard, Pillsbury has just been Pillsbury, as its shareholders expect it to be. And it knows that My Dough Girl isn’t, and can’t afford to litigate. Oh, sure. You want to know what I think about if she could? And the law were actually applied properly — it certainly isn’t always, now, is it? Oh, My Dough Girl would win. Win, win, win! But hey, bakery or not, it’s all about the dough, boy. UPDATE: Dough Girl, as predicted, folds; welcome to RubySnap! While you’re the expert and I’m the opposite, I’m going to quibble here. 1.Similarity? Not much, really. This is a pretty subjective undertaking, of course, but as we say here in New York, likelihood of confusion comes down to â€œThe ultimate question of whether, looking at the products in their totality, consumers are likely to be confused,â€ right? Well, gut-level-wise â€” which, after three years and half a million to a zillion dollars of litigation down the road, is what this factor seems to always come down to, survey or not â€” this trademark lawyer doesnâ€™t think that, looking at the products in their totality, consumers are likely to be confused. Here’s where I have to disagree. At one point, there was Poppie, the Pillsbury Doughgirl. While I realize that’s not the mark in question, it’s a related character. And at least some people still remember her. (Full disclosure: my Uncle’s name is Pillsbury — no relation, but it means I saw a lot of Pillsbury merchandise when I was a kid.) So I don’t think we can completely dismiss the likelihood of confusion. Some small chunk of the public might be confused. 2.Intent? A toss-up, absent some smoking gun (e.g., email that says, â€œHey, letâ€™s name the bakery after the Pillsbury Dough Boy!â€). Judging by the web site (and assuming she didn’t revise it in light of the legal maneuvering), it looks pretty plain that she’s trying to invoke Dough-Boys-the-troops, not Doughboy-the-doll. There’s a retro-nostalgia air that’s pretty clear. 1.Ad | Dismission of the likelihood of confusion should rather be based on the grounds of this particular confusion being so unquestionably obvious that it interferes with the consumers’ buying decision. Not with their precious childhood memories (‘at one point there was Poppy’), and the even more cherished present day. 2. 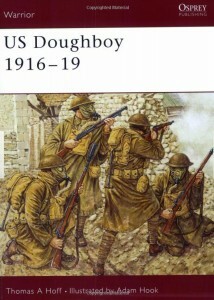 U.S. Doughboys 1916-19, a globule of dough yummie named Doughboy (whatever) happy to be baked in the oven, and a pretty My Dough Girl with a hint of 1940es (hic!) retro-nostalgia — so different the associations. Maybe, somewhere these will be confused between by the consumers — in Africa or in Asia. In the US? Very unlikely. P.S. Oh, just curious: what is meant actually by you being “the opposite”? Thanks! ‘6. Strength of the mark? Thatâ€™s what the whole first part of this post is about. Verdict on this factor: Itâ€™s strong, man, itâ€™s strong.’ — Indeed. Very strong brand. The post, too. What saddens me is another Salt Lake area sandwich shop could be next on their chopping block. “Flour Girl and Dough Boys’ has been around about three years and are delicious. And I’ve not once thought about Pillsbury until their suit with My Dough Girl. This is just the typical big bad corporation trying to take out the little guy. They know their pockets are deeper than hers and they probably wish she would attempt to fight and by doing so she would end broke from trying to litigate and her bakery gone. The important thing here is that if you have ever tried My Dough Girl fresh cookies or frozen dough, there is no mistaking it for anything Pillsbury. I live here locally and rely on Dough girl weekly to get my delicious fix. I am also soo glad that they ship so I can send some to my friends back home. I love their Vivianna cookie with a fine french dark chocolate and mangoes, also the November specialty cookie named Isabella (Pumpkin cookie with Frangellico soaked raisins topped with a marscapone frosting) is to die for. Long live My Dough Girl!! !